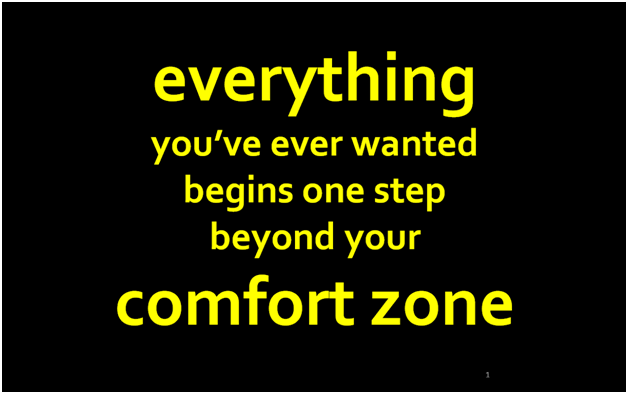 Everything you have ever wanted …Begins one step beyond your comfort zone..! What are the steps? Start with thinking bigger than your current comfort zone. Leave the familiar, learn something new and bring it back to serve others. Make sacrifices that make a difference. 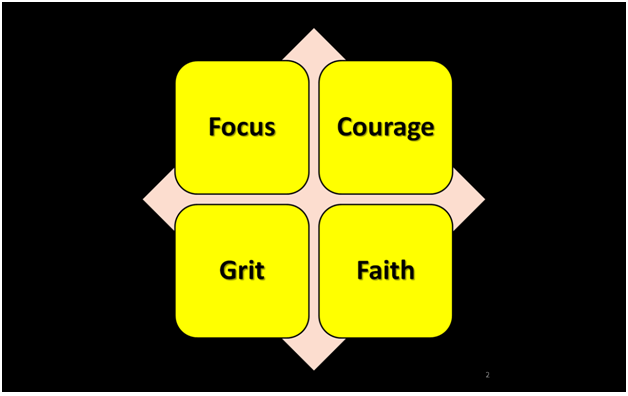 Once you have decided to step beyond your comfort zone there are four virtues needed for success. Grit is the tenacity to keep going when you are tired and don’t feel like going on. It is the most predictive element of success. Focus: is answering the question what am I creating. The intentional beliefs and self-concepts we believe in. Who we are and how we think and how we behave. Are you the kind of leader a person would want to be with? If you are, you will attract people who want to follow you. Set Goals, for goals to be valid your must: State it, Publish it and Share it. Look at your own self talk, what are you saying in your head. What you are saying in your head is how you see the world. How we mentor ourselves is how we lead others. Take a close look at our self-talk in our heads. If you tell yourself, you are not good enough as how should it be. Have a vision a vision of yourself, as you want yourself to be. We don’t see the world as it is…. We see it as we are..! It takes Courage, Grit, Focus and Faith to be successful when going beyond your comfort zone. Growth comes from going beyond your comfort zone to your growth zone. 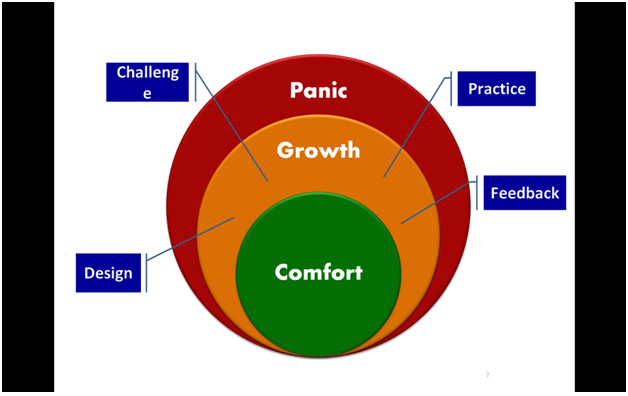 He pointed out that if you go too far outside your comfort zone you may enter the panic zone. It is ok to venture there every so often, just do not go too far and end up in the panic zone too often. 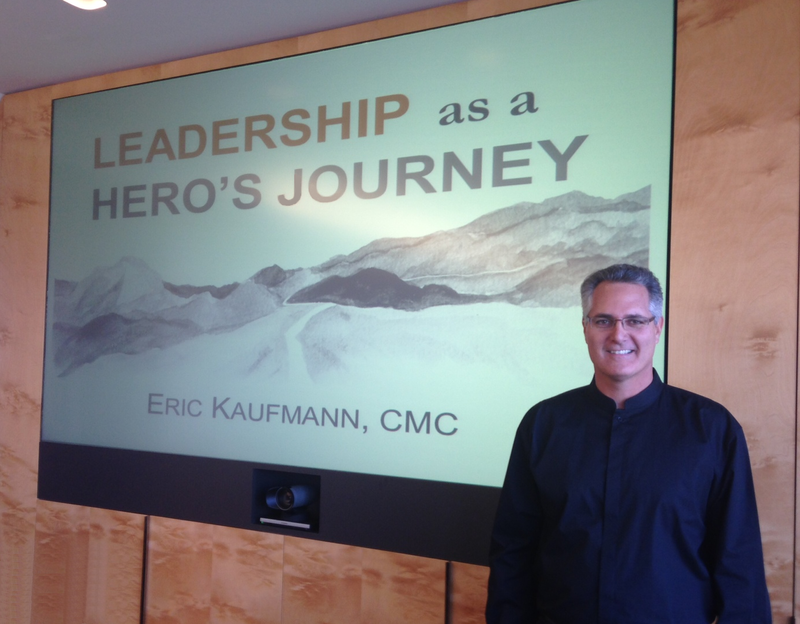 Eric Kaufmann guides leaders to make better decisions and achieve better results. He has two decades of experience in sales, management and leadership at Lanier/3M and at Corning Labs. In 1999 he launched and executive development consultancy which had served: Sony, T-Mobile, Genentech, Alcon Labs, Teradata and many senior manages of Fortune 1,000 companies. He is an Adjunct Professor at San Diego State University and Cal State San Marcos and is a speaker for Vistage International. His book,” Leadership as a Hero’s Journey”, explores the four traits shared by successful passionate and creative business leaders. The book describes how they navigate through uncertainty and anxiety in order to improve the lives and livelihood so those around them. Presentation by Jamey Power, President of Power Family Associates, and Former SVP of JD Power Associates. This entry was posted in CA, Marketing, Orange County, Phil Sallaway, Salesforce, Uncategorized and tagged Eric Kaufmann, Leadership Is a Hero's Journey, Sagatica, Sales Leadership Alliance. Bookmark the permalink.